I have never seen a movie divide so many people like Superman Returns. The movie opened to mix reviews, from critics and fans, back in 2006, but the reviews were incredibly divisive. Some fans really embraced the movie, others saw it as a tired retread of the original Donner/Reeve movies from decades ago. And that still holds up today. Fans debate it, probably even right now, and likely won’t stop until the next Superman film hits theaters. But, until this, Superman Returns brings Superman to a whole new audience and, in my opinion, this is executed in a stylish and classy manner. Director Bryan Singer gives us a somber and intimate look at Superman and how his presence affects the world around him. He’s back. A hero for our millennium. And not a moment too soon, because during the five years (much longer in movie-fan years!) Superman sought his home planet, things changed on his adopted planet. Nations moved on without him. Lois Lane now has a son, a fiance and a Pulitzer for “Why the World Doesn’t Need Superman.” And Lex Luthor has a plan that will destroy millions – no, billions – of lives. Filmmaker Bryan Singer (X-Men) gives the world the Superman it needs, honoring the legend everyone loves while taking it in a powerful new direction. Brandon Routh proves a perfect choice to wear the hero’s cape, leading a top cast that includes Kate Bosworth as Lois and Kevin Spacey as Lex. And the thrills – from a sky-grapple with a tumbling jumbo jet to a continent-convulsing showdown – redefine Wow. “I’m always around,” Superman tells Lois. You’ll be glad he is, and you’ll be glad he’s back in Superman Returns. Seeing as how we’ve been through this before a couple years back when Superman Returns originally premiered in both theaters and on home video, I’ll keep my thoughts brief. Now, this movie was definitely not what I expected when I first viewed it during the Tuesday night sneak peek back in June 2006. I expected something to pay homage to the classic Richard Donner Superman films, but not be directly linked to them. I was initially skeptical of this venture, but was surprised at how well it paid off. What we get is Superman’s return to Earth after a lengthy absence, a story that can also easily reflect the long absence of the Man of Steel from the big screen. But now he’s back, and clearly, not everyone is happy about it. Singer’s approach to Superman’s return allows us to feel the weight of it and how big this is for the characters in the film. We’re not immediately tossed into countless action scenes, but we feel the drama of it unfold, setting up future installments and giving the characters some real depth. We feel how dramatic and important the Man of Steel’s return is, pulled off perfectly by the cast of the film (though Kate Bosworth could use some lessons from an acting coach). Handling it in this fashion allows us to easily accept some of the more sillier attributes to the characters and situations, making it easy for the audience to look past the spandex and relate to these characters. We’re given an understanding of every character and where they come from (and feel). Singer also uses this opportunity to make some major changes to the Superman mythos, adding a much needed boost to a formula that can go stale so easily. The decisions he makes in the movie are bold ones, but ones that will pay off amicably down the line. And yes, it works, but that doesn’t mean Singer’s film is perfect. The major flaw (and the movie does have a couple) is Superman Returns is the noticeable lack of action. True, the shuttle sequence is absolutely amazing, but that’s really the big action sequence for the movie, and it happens quite early in the overly epic-length movie. While Superman may be facing some of his biggest emotional obstacles to date, where are the physical obstacles? I can only imagine this will be rectified in future Superman movies, but hopefully the emotional pull to the characters will remain. While I appreciate that Singer went for a more epic and emotional approach to the character, not just giving us brainless action sequences and constant one-liners, the movie does feel a bit lopsided. Still, Singer has made these characters interesting and engrossing, resulting in a movie that’s addictively watchable in all respects. As I said, I’ll wrap up my brief thoughts here, but if you want a more thorough review, check out our review of Superman Returns here at our parent site, The World’s Finest. There are a couple more things I could say about the movie, but I feel that I’ve touched upon the major issues, both positive and negative, about this great feature film. Superman Returns is a solid film that plays out well, easily belonging at the top along with some of the greatest comic book films to date. I’m sure that previous comment may be somewhat controversial among the fan community, but I find that Superman Returns, even two years later, is one of the most misunderstood and underrated movies every released. The film may have a flaw or two, sure, but Singer has made Superman an engaging big-screen character, full of depth and a surprising amount of emotion. Superman Returns comes Highly Recommended, offering a solid addition to the rich Superman mythos. 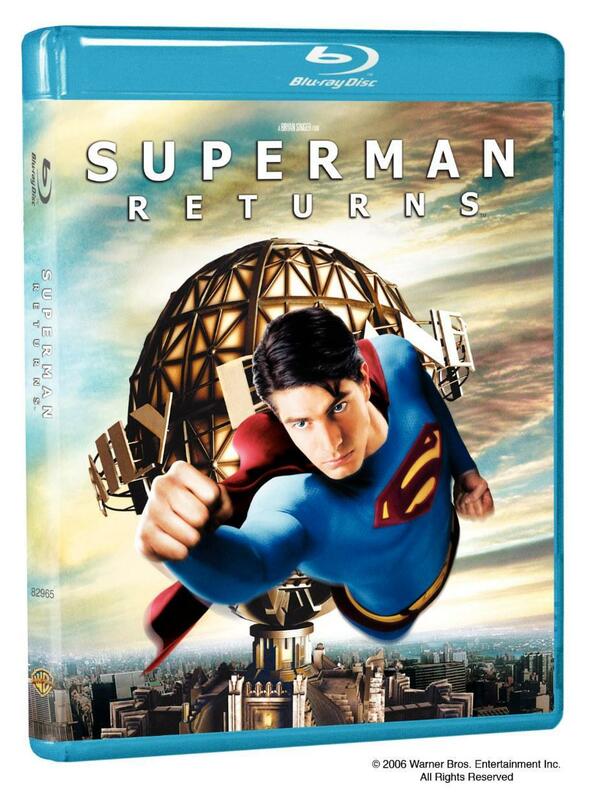 As many readers may know, this is the second go-around for Superman Returns on Blu-ray. It’s initial release was exactly the same as this one, save for one glaring fact. The previous release didn’t have a TrueHD track, just a Dolby Digital 5.1 track, so, as you could imagine, the audio was lacking. It was still good, don’t get me wrong, but it was lacking that punch that only TrueHD could bring. Oddly enough, the HD-DVD release of Superman Returns had the TrueHD track, yet Warner Home Video didn’t include it in the original Superman Returns Blu-ray release. Odd. 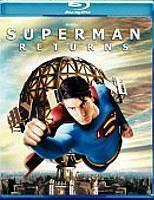 Thankfully, Warner Home Video fixed that with this newly re-issued released of Superman Returns on Blu-ray. So, let’s look at the disc itself and see how it stacks up! In terms of audio and video, Superman Returns looks just about perfect in every respect. Shot entirely using HD technology, there’s nary a blemish or mistake to be found. Superman Returns looks unbelievably pristine and perfect. Now, there may be a few imperfections, as I believe I noticed some slight digital fuzz here and there, but, overall, I can’t believe how pristine this transfer looks. The only major fault is that the image seems a bit flat, but that is apparently the result of the HD technology used, so I won’t hold that against this great transfer. As for the audio portion, well, the TrueHD audio transfer makes all the difference – it truly does. While 5.1 Dolby Digital track sounds fine, the TrueHD adds that extra punch that really kicks the audio up a notch. You thought the “Shuttle Scene” sounded cool before? Yeah, well you haven’t heard it until you’ve heard it in TrueHD. The extras are, as we all know from the original release back in 2006, simply amazing. Providing some of the best comic book-themed bonus content, Warner Home Entertainment really hit it out of the park for the extras here. Included is an excellent three-hour documentary, deleted scenes, a short featurette on bringing Marlon Brando “back to life,” an assortment of trailers, and another small thing or two along the way. Given that all of these bonus materials have been covered before, I’ll just quickly note a few things. The three-hour documentary covers just about everything of the filming process in great detail; from pre-pre-production to the final days of shooting Superman Returns. Nearly everything involving production is covered, though at times it seems like we’re not getting the whole picture. There are moments in the documentary where it jumps from Bryan Singer being happy to being incredibly pissed off, even screaming at the camera crew to shut off their cameras. I get the impression there’s a bit more left to be told, as this was undoubtedly a stressful shoot for Singer. Still, an incredibly thorough and pleasing documentary. The deleted scenes, for the most part, should’ve remained in the film. There’s a fair amount of great material, specifically the Smallville stuff, that would really fill out the movie nicely and even answer some of the questions movie-goers had of the film (such as Lois not even cluing in to Clark and Superman returning to Metropolis at the same time). There are a couple scenes that don’t need to be reinserted, but overall I feel the movie would’ve been stronger if these were left in. Now this is how you do a bonus features-laden Blu-ray release, Warner! The content here is overwhelming, and it’s all on one disc with any loss to the audio or video quality of both the main feature and the bonus content. Everything looks absolutely perfect. A three-hour documentary pairs with the nearly two-and-a-half hour movie, on top of other small extras, rounding up to six hours of entertainment all on one disc. Now compare this disc, which originally came out in 2006 before being reissued in September of this year, and compare it to the recent The Dark Knight Blu-ray release and behold how Warner Home Video could get something so right with the Superman Returns Blu-ray release and then mostly wrong for the The Dark Knight release. It is absolutely staggering comparing how differently both releases were handled. Superman Returns is easily one of the best super-hero Blu-rays releases and I sincerely hope Warner Home Video looks at this release when they approach The Dark Knight for the inevitable double-dip. Superman Returns is an absolutely beautiful Blu-ray release, no question. Overall, a staggering collection of extras that really do justice to a great film, a film that is one of the best in the comic super-hero genre (easily in the top five). And now, finally, Warner Home Video has done justice to Superman Returns, especially when it comes to the technical aspect of the release. The new audio track sounds so full and boisterous, aided by an excellent video transfer. If you want to experience Superman Returns, this is the version to have. Just be sure to double-check before you purchase the Blu-ray, especially reviewing the technical aspects listed on the back cover. Overall, considering the entire package, it’s a worthy addition to any fan’s DVD collection and a worthy successor to the Donner/Reeves Superman films. Highly Recommend. Superman Returns is now available to own on DVD and Blu-ray.